One year I just got completely frustrated with all the consumerism associated with the holidays. Every year we were struggling to equal or top last year’s gifts. Then there was the shopping, the crowds and the mounting EXPENSE! Now don’t get me wrong I’m not against gifts. They’re a fun way to share our love with those around us. RancherMan & I had a heart-to-heart talk with each other that year & decided although it would take much more effort on our part, we wanted to give more personal gifts. Something from both of us, straight from our hearts. We’ve now been doing this for several years – way before I had my own blog. So I don’t necessarily have pictures of everything to show you. But I thought it would be helpful to know some of the gifts that we’ve given that were well received. We took some of the more interestingly-shaped ones and washed them up. We bought glass paint pens and painted a different design on each one. Then we bought rubber-cork/flower *hummingbird feeder tips and made our own very cool hummingbird feeders. We included a pkg of homemade hummingbird nectar along with the instructions so they could make more homemade nectar when it ran out. 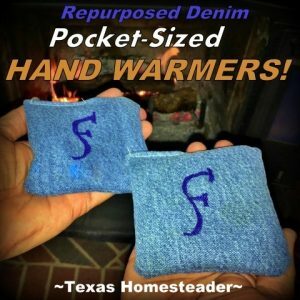 ~ Repurposed Denim Pocket Warmers – This gift has been wildly successful with all our family members both old and young. Just warm them in the microwave for a few seconds and BOOM, delightful warmth. Place ’em in your pockets to keep you warm when you must go out on a cold day. NOTE: I often sell these cute denim pocket warmers on our Online Store. 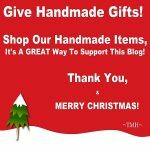 So if you don’t have time to make them yourself but still want to give a hand-made gift, we’d be honored if you’d check out our store! ~ Pasta & Pasta Sauce – We like to make consumable gifts whenever possible since we don’t often know preferred colors or designs, nor what the gift recipient already has or wants. Often our consumable gifts are food items because c’mon, everyone likes to eat! Now our gifts come from BOTH of us, not just me. When making our Christmas gifts RancherMan is right there beside me doing the work. It’s a true sacrifice for him since cooking & canning’s not something he enjoys. A true gift from his heart! 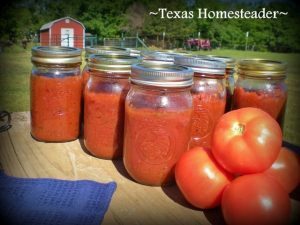 One year we planted extra paste tomatoes in our garden and when they were harvested we cooked and canned pasta sauce. We also made homemade pasta and packaged it all in stainless-steel strainers with stainless steel spaghetti utensils. ~ Homemade Food Gift Baskets – One of our favorite things to give are homemade food baskets. The contents of these baskets obviously change year to year based on what I’ve been able to grow in the garden or make & can throughout the year. 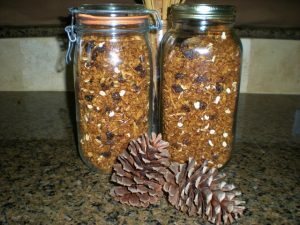 One year we shared my favorite Pumpkin Granola packaged in reusable hinged glass jars. Of course work on this gift started waaaaay back in the spring with the planting of heirloom pumpkin. Then the weeding/watering/harvesting of that pumpkin. Followed by cooking that pumpkin down into puree and then finally using that puree in my recipe. I feel good knowing we’ve put so much of ourselves into this gift. Even the pecans are harvested & shelled from our own trees! The dried fruit in the granola can be dehydrated plums, or perhaps dehydrated apples shared from my aunt’s trees. Some years I’ve dehydrated jujube from our own trees. ~ Apple Item Canned Goods – One year our gift basket was entirely apple themed. My aunt invited me to pick the apples from her tree and we came home with boxes & boxes of delicious apples. RancherMan & I spent weeks in the kitchen peeling, chopping cooking and canning apple products. We made apple-pie filling so our little bakers could just plop that jar of pre-made filling into a crust and have homemade apple pie in a flash. We also made and canned creamy apple butter, Cinnamon/Vanilla Applesauce, cinnamon-spiced apples and apple slices in light syrup. Another big hit was the dehydrated sugar-cinnamon apples perfect for snacking. ~ Homemade Pear Preserves – A fun thing to include in a food gift basket is homemade pear preserves. 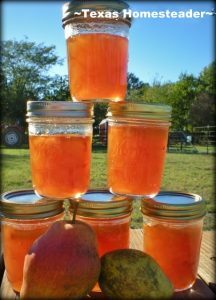 A sweet friend had allowed me to harvest the leftover pears from her tree and another sweet friend shared her pear preserves recipe that has always been RancherMan’s FAVORITE. 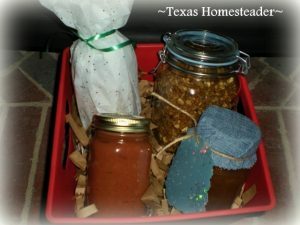 ~Gifts Packaged Beautifully – Sometimes if I was giving a jar of home-canned goodies to a neighbor or friend, I wanted a lovely, rustic way of presenting my gift. Mama always says: “Presentation is half the gift” and mama’s always right. 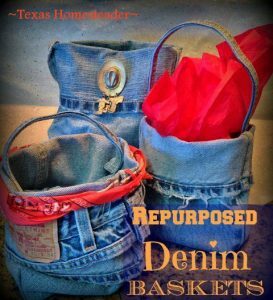 I started making these fun and oh-so-cute denim baskets using repurposed denim from RancherMan’s worn jeans. I love that they are so easy to make even with my beyond-novice sewing skills. And can be embellished in so many cute ways. ~ Venison Jerky – A couple of years ago we gave homemade Jerky made from venison that RancherMan harvested. We bought a * jerky gun and a flavoring kit. Then it was simply a matter of taking the ground venison, adding the seasoning, mixing it all up and “shooting” it onto the dehydrator trays and drying the meat. This gift was very, very well received. ~ Wild Game Summer Sausage – One year we gave processed wild hog meat. One of the wild hogs that RancherMan harvested right here on the ranch was processed by a wild-game meat processor. Some of the meat was made into summer sausage and jalapeno-cheese snack sticks. The meat was presented in a new small soft-side cooler with reusable ice pack. ~ Homemade Cold-Press Soap – Although this was waaaaaay before I started the blog, one year we made a couple of kinds of homemade soap. This was a really fun and unique idea that was very well received. One of the soaps was made using rosemary from my plants right out back that were dried and crushed. We made gentle unscented Castile soap as well rosemary-scented and vanilla-scented soaps. We’ll be doing this again soon so watch for the tutorial on the blog. UPDATE: I’ve posted about our homemade Rosemary/Lavender Soap using botanicals from right here on the ranch. I’ve also posted about our Vanilla-Scented Shampoo Bars. They were both very well received by our gift recipients and of course RancherMan & I are able to spoil ourselves with some pretty incredible homemade soap too! 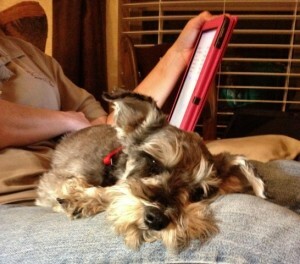 ~ Something For Fido – Can’t forget those pups! Many of our friends & family have dogs and my healthy Homemade Dog Treats is a fun thing to include in our gift baskets for their fur babies. So there’s a list of some of the fun homemade gifts we’ve presented over the years. What are your favorite homemade gifts to give or receive? 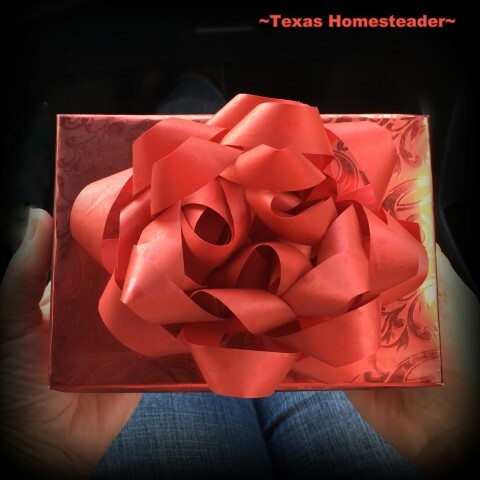 This entry was posted in Blog Posts and tagged Christmas, Frugality, Holidays, Make-It-Yourself, Winter on November 30, 2014 by Texas Homesteader. I wish I were on your gift list! 😉 These are awesome gift ideas!! I love that so much of you and rancher man’s time and efforts went into these gifts making them that much more special to the recipients. I’d much prefer any of the gifts on this list than something from a store! Thanks so much for sharing your ideas – perhaps I’ll get inspired for next Christmas. Homemade gifts are the best. Great ideas. Thank you for sharing with us at #HomeMattersParty . We would love to have you again next week. These are great ideas and will be featured in next week’s Waste Less Wednesday Blog Hop. I expecially want to try the pumpkin granola. That sounds delicious! Thanks for sharing! What practical and wonderful ideas. I particularly like the hummingbird feeder and nectar! Another great thing(s) about gifts like these is that they don’t have to be eaten right away, and you aren’t decorating someone else’s house – you know, like the pink crocheted toilet seat cover:) Merry Christmas. Homemade gifts are the best and everyone loves good food and little treats. These ideas sound delicious. I want to keep the pear preserves and pumpkin granola all to myself, haha. Thanks for sharing on Merry Monday! These are great gift ideas. I love homemade Christmas gifts! 🙂 Thanks for sharing at the Homestead Blog Hop! Pingback: Environmentally-Friendly Gifts Can Be FUN! G’day Love this! Thanks for sharing at our #SayGdayParty! Pinned! Please revisit (if you haven’t already); comments and shares always welcomed as well as visiting someone else at the party Cheers! Joanne What’s On The List? What awesome gifts! I would love that pumpkin granola or homemade sauce! My hubby looks forward to the homemade barbecue sauce he gets every year from a co-worker. My favorite gift to give is homemade flax seed heating bags. Looking forward to seeing your post on how to make soap! Wow, your homemade goodies look like great gifts. I would love it if someone gave them to me. In our family, homemade is always best! You’ve put out many sweet and attractive homemade gift ideas, and I thank you! There is nothing as nice as receiving a wonderful home made food gift for Christmas like the ones you’ve made. I particularly like the tomato sauce! Home made gifts are great, I know I have received several. I also make some home made ones. This year many are getting Christmas pillowcases, and one grandson is getting a Christmas quilt. It is really fun to make gifts for others too. I feel by giving and receiving homemade gift baskets are the Best as they are given from the heart and made up of love. Nothing pleases me more than receiving a homemade gift item cause I know great thought had gone into it. My daughters where younger they would always make me a homemade card for Christmas and for my birthday which always meant a lot to me and I still have them items that they had given. It is so much fun; yes time consuming, making up gift baskets so each individual on their likes from homemade baked goodies ; seasonings, meat rubs, different varieties of Chex Mix party mixes, right down to a homemade ornament of sorts. I even sit down and make All homemade cards for anniversaries, birthdays, holidays and everything in between. I haven’t bought a store bought card in years. The nice pretty store bought cards are getting so expensive and I can make them cheaper and make them more personal and meaningful. Yesterday in fact I made 2 batch of homemade Ritz Bits candy; one chocolate and one vanilla flavor. I had always told the girls, cause they would always ask what I would want so I would tell them; if you’re going to get me something, make it homemade; even if it’s a plate of cookies. Over the years I haven’t had to mention that fact cause they automatically know . Going to Christmas Eve candlelight services as a family is one of the greatest gifts of all. Just being together and then coming back to the house afterwards for some good, down home, homemade soup supper.